When it comes to social media, the focus – by nature – should always be on people and relationships, not tools. 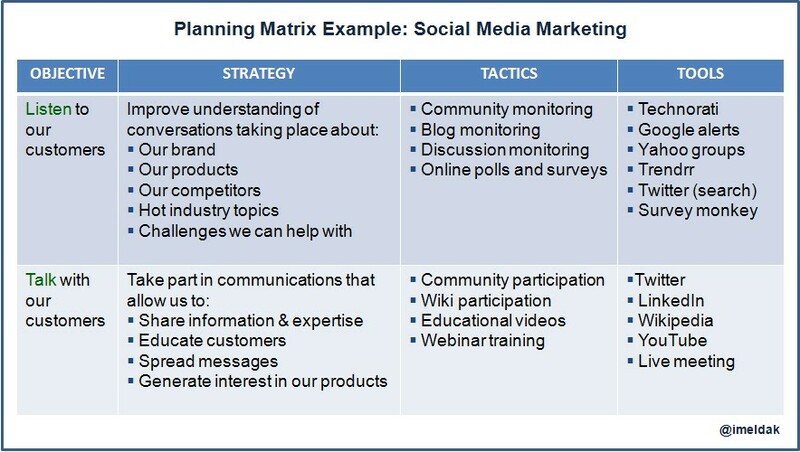 This means that social media planning does not begin with a Twitter strategy. If you’ve read any of my previous posts, you will be familiar with my disdain towards that popular question “What’s your Twitter strategy?” *puke*. As we know, Twitter can be used to help achieve certain objectives and strategies, but should not be seen as a strategy in itself; it is a tool to get things done. Just like direct mail is one tactic that can be used to generate demand, Twitter is a tool that can be used to listen and engage with customers. This is important for people within an organization to understand, and it is more than just about being a terminology snob. Why? As with all planning, if you start deep diving directly into tools and tactics without knowing exactly what it is you are trying to achieve and why, then there is risk of completely missing the point, and wasting time and money on executing the wrong things, for the wrong reasons. This is why I’ve found it useful to use a matrix-like system to help organize thoughts and avoid the tactical deep dive approach. The headings (objective, strategy, tactics and tools) help provide focus for your ideas. You can then use this as a template to build out the details around your plan (not forgeting metrics, of course). Hey – do you have a larger version of that planning matrix? I’d love to see that matrix as well – looks like a great tool. Thanks!